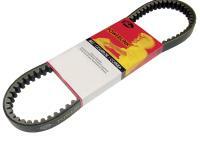 Gates Powerlink Premium CVT Drive Belt size 828 X 22.5 X 30. Specifically designed for a variety of motorized CVT applications including street-legal scooters and go-karts Constructed with the latest technology and materials- these belts provide fast and easy acceleration- fuel efficiency and smooth resistance. Standard belt has OE-equivalent performance- premium belt provides longer durability and high-performance.